Toujours Magazine: Interiors. Lifestyle. Attainable Beauty. 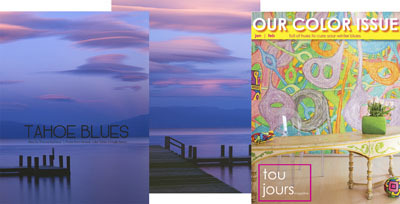 Kudos to Toujours Magazine on their Color Issue – just in time to lift our winter greys. This one is a bit closer to my heart as it features Tahoe Blues, an 11-page spread of my Tahoe writing and photography (pages 84 – 95). Check it out. Insightful. Interesting. Inspiring. This entry was posted in Lake Tahoe, Magazine, Photography, Travel by Thomas Bachand. Bookmark the permalink.